These two REITs pay strong dividend yields and have lots of potential to grow. With the stock market just under its all-time highs, it's getting more and more difficult to find investments that could be called "cheap." One smart place to look for attractive values and strong dividends is in the real estate sector. Here are two equity REITs, both of which pay over 3% dividends, that look attractive enough to buy right now. An investment in our "nation of renters"
Apartment real estate investment trust Equity Residential (NYSE:EQR) could be a smart way to invest in some of the most attractive rental markets in the United States, at a time when the homeownership rate is at a generational low. 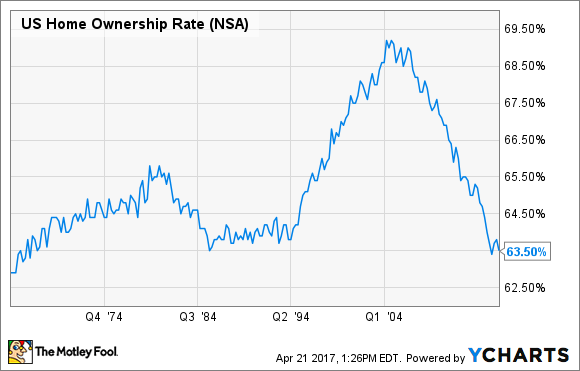 U.S. Homeownership Rate data by YCharts. The company owns or has an interest in 315 apartment properties with nearly 80,000 individual housing units, most of which are located in expensive, high-barrier, urban rental markets. In fact, the entire portfolio is located in six coastal markets -- Boston, New York, D.C., Seattle, San Francisco, and Southern California. Equity Residential specializes in apartment buildings in high-cost locations. (Note: Image is not one of EQR's properties.) Image source: Getty Images. These markets have high costs of homeownership, as well as stronger-than-average growth in new renter household formations. These markets have experienced 50% higher income growth than the U.S. average since 2003, which has led to a superior rental growth rate and low vacancies. Equity has done a great job of increasing its income while managing expenses. Over the past decade, Equity's same-store revenue has grown at a 3.2% annualized rate, while expenses have grown by 1.8%. In addition to maximizing revenue at its existing properties, Equity has several other ways to create value for shareholders. Development is one way Equity adds value -- if you can build a property for less than its completed value, you can earn higher yields and create instant equity. Renovations are another focus right now. Equity plans to invest about $50 million per year in kitchen and bathroom upgrades, and these renovations produce a yield on cost of 12%-15% per year. And, with one of the best investment-grade credit ratings in the REIT sector (A-/Baa1), Equity has the financial flexibility to pursue attractive opportunities as they come up. Equity's stock price has fallen 10% from its peak even though its business is strong, mainly thanks to the expectation of rising interest rates. Now could be a great time to get into one of the biggest and best apartment REITs at a discount. Many investors are reluctant to invest in physical retail of any kind, and who could blame them? Many retailers are struggling to stay in business, and on the day that I write this, Bebe Stores announced plans to close all of its retail locations and focus on e-commerce. However, take a look at Tanger Outlets (NYSE:SKT), which owns 44 outlet shopping centers in 22 states and Canada. The stock has fallen more than 22% from its peak, and now has an attractive 4.1% dividend yield. The company is a member of the S&P High Yield Dividend Aristocrat Index, having raised its dividend every year since its IPO nearly 25 years ago. Most of Tanger's properties are in the eastern half of the United States, and they currently boast an impressive 98% occupancy rate, so there's no sign that Tanger's properties are losing stores. In fact, Tanger's occupancy has never fallen below 95%, no matter what the economy has done. As President & CEO Steven Tanger says, "In good times people love a bargain, and in tough times, people need a bargain." In other words, Tanger's business model works in all economic environments. Image source: Tanger Outlets company presentation. One of my favorite things about Tanger is its growth potential. The outlet industry is rather small, with a total of less than 70 million square feet of space, of which Tanger owns more than 20%. This means that there are limited opportunities for acquisitions, but there is plenty of room for ground-up development, which as I discussed with Equity Residential, can be a great way to create value. The company has two projects currently under construction, and Tanger says that it has begun site selection and pre-development activities in other markets that aren't currently served by the outlet industry. As far as financial ability to expand goes, Tanger has an investment-grade credit rating (BBB+/Baa1) as well as an excellent interest coverage ratio of 5.23-to-one. In other words, the company earns $5.23 for every $1.00 it pays in interest on its debts, a low ratio relative to most other REITs. To be fair, both stocks could easily fall further, especially if interest rates rise faster than the market expects. Plus, there are company-specific risks involved with each of these stocks. Just to name a couple of examples, we could see an unexpected uptick in the homeownership rate, which could lead to reduced rental income for Equity Residential. Or, Tanger could lose a major tenant to financial difficulties, which could cause the company's earnings to take a hit. The bottom line is that no stock capable of market-beating returns is without risk, and these two are certainly no exception. However, I believe that any negative catalysts are likely to be temporary and that both of these companies have bright futures ahead.